Start-to-finish homebuilding for over 25 years. Founded in 1989 by Todd Stinson and Matt Metzko, Cedar Crest Builders specializes in building custom homes and other start-to-finish projects that include excavation, septic, framing and finishing. We pride ourselves on delivering the finest craftsmanship — perfect down to the smallest detail. 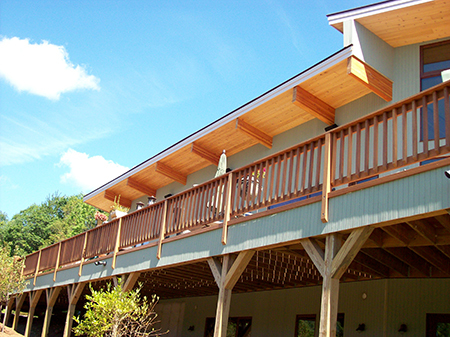 We are adept at turning our clients’ dreams into reality: Custom Stick Built Homes, Log Homes, Timber Frames, Modern / Contemporary, Energy Star-rated Green Homes, and Light Commercial—we build it all! Your vision. Your budget. Our pleasure. We are happy to work with your architect or ours to plan your project. Our two crews of six are extremely responsible and respectful. Our work sites are neat and clean. Our customers are happy — read their testimonials. Based in South Kortright, New York, in the northern corner of Delaware County, in upstate New York, we’ve built homes all over the Catskill Mountain region. Our clients live and work in Delhi, Bovina, Roxbury, Andes, Margaretville, Halcotsville, Bloomville, New Kingston, Franklin, Oneonta, and beyond. Their happiness (and yours) is our goal. To begin the process of creating your own dream home, please contact us.